Farmer and FG reader, Lenice Bell, has survived a tough trek on horseback across Argentina and Chile on behalf of the Anthony Nolan Trust, raising £4,600 for the charity. The trek, one of the trust’s Ultimate Challenges, meant up to 10 hours a day in the saddle for the 10 participants (pictured above). They made rough camp each night on the route, which ran from the mountains above Mendoza on the Argentine border to the western side of the Andes on the Chilean border. Lenice said: “The whole experience was incredible – a true challenge. I’m a country person, but this was just wonderful – the wilderness was amazing. “We saw so many wild flowers, condors, humming birds – the eagles flew so low you could see the yellow of their beaks and I’d never have thought I’d get a buzz out of seeing puma poo! Endurance stalwart Nancy Beacon is the first recipient of Endurance Canada's Hall of Fame Award. Beacon of Flesherton, Ontario, has contributed significantly to the development of the endurance sport, in both Ontario and Canada. Over the years she has spent considerable time mentoring up-and-coming riders, including allowing them to compete on her veteran horses to get started in the sport. Many of today's top riders owe their start in the sport to Beacon. She was founding member of Canadian Long Distance Riders Association, has been a Lay Judge at many rides over the years, worked as a course designer for many rides, been the Trail Master for several Federation Equestre International (FEI) rides held in Ontario, and hosted the first Canadian FEI Endurance competition in 1989 in Ontario. * To learn how to adapt to imperfections! Lisa Maxwell – will look at how you and your horse move together, making suggestions for balance, ‘things to work on’ to make endurance easier on both you and your horse. Others -- to be announced. Horse and Rider: Full, individualized evaluation by all clinicians. Participate in lectures, in individualized or paired rotations with the clinicians, and in trail groups to practice and assess. Limited to 12 participants. Auditors: Participate in lectures; associate with a horse-rider participant through the individualized sessions, listen, ask questions, learn. Limited to 12 participants. depends on clinicians, to be determined. Bring your own food. Coffee, tea, and potable water are available. Less than six months after the first horse was infected, all properties in the Australian state of New South Wales (NSW) have been declared free of equine influenza. "I can say today that not one horse in NSW is now known to have equine influenza," said Ian Macdonald, NSW primary industries minister. At the peak of outbreak, more than 41,000 horses were infected on more than 5,800 properties. Macdonald said the government has spent more than $46 million containing the exotic disease, which escaped from a government quarantine center. More than 100,000 horses have since been vaccinated. "Today is a tribute both to the people who have been directly engaged in the battle against (influenza) and the horse industries, and the thousands of horse owners across the state whose vigilance, discipline and cooperation have been critical to stopping the spread of the virus," Macdonald said. The government's goal has been to totally eradicate equine influenza from NSW by mid-March. "Extensive testing is on-going to ensure we have not missed any isolated pockets of disease and it is vital that horse owners remain vigilant, report any sick horses, and observe movement restrictions," Macdonald said. * Implemented a successful zoning system to free up movements and allow breeding season to be undertaken and racing to resume. A 150 kilometre camel endurance race being planned in western Queensland is attracting international interest. Arid Lands Australia will hold its inaugural festival in Hughenden in August and says it is about to issue an official invitation to the president of the United Arab Emirates to attend the event. President Paddy McHugh says the race will offer $50,000 in prize money and he is confident people from across the globe will attend. "Absolutely ... the United Arab Emirates will have at least two or three vets who will be part of the veterinary team," he said. "Then we've got interest coming from Canada, America, New Zealand, Malaysia - there's little bits of bites - we've got some interest out of Saudi Arabia as well to come and view the race. "You've got to remember with the camels over there, it is their lifestyle, their world and for us to do something like this over here, they pay a bit of attention to it I suppose." feel very fortunate to have shared it with him. often and is a testament to his joy in doing a job he loved. our time has come, they will show us the way". Top New Zealand-bred horse Dell Hama, who is currently equal second in the FEI's world endurance horse rankings. New Zealand horses and riders have featured prominently in the recently released 2008 FEI World Rankings. The FEI has added two new categories to the rankings, the Open Horse and Junior/Young Rider Horse categories. Rankings include events up to 11 February. In the Open Horse category, Dell Hama is equal second with fellow New Zealand-bred Rhan. Dell Hama won the 2008 Dubai World Challenge earlier this month, and Rhan was the victor in the South Island 160km championship last month. Of the riders, New Zealand's Alison Higgins (11) is the sole non-UAE rider in the registered rider world ranking list, which is topped by Hamad Mohd Al Ahbabi. In the Junior/Young Rider rankings, Kiwi Jaime Heywood is third equal. Vigar Shamah is ranked third in the junior/young rider horse rankings. Waleed Al Hammadi who finished first in the race is seen with his trophy . 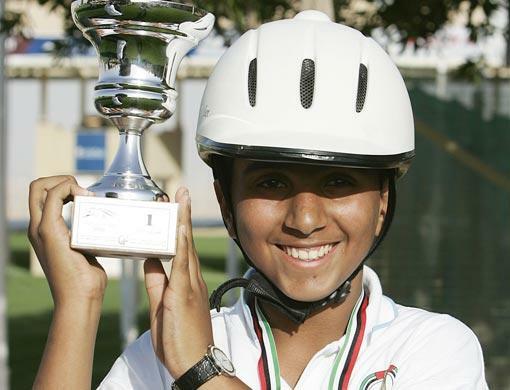 Abu Dhabi: Fifteen-year-old Waleed Hassan Al Hammadi riding Sharqi created history when he became the first winner of an long-distance horse race for persons with special needs at the Emirates International Endurance Village in Al Wathba on Thursday. The long-distance ride, being held for the first time in the Middle East region, was held under the patronage of Shaikh Mansour Bin Zayed Al Nahyan, Minister of Presidential Affairs, and was organised by the Zayed Higher Organisation for Humanitarian Care, Special Needs and Minors' Affairs. It certainly was a red-letter day in UAE sport when 13 youngsters proved that nothing can come in the way of their determined effort and in a pacey finish, Waleed finished ahead of Matar Al Rumaithy on Silverstar while Sultan Al Khaily on Hattaf was third. But the biggest cheers were reserved for Sara Al Qubaisi, the only lady participant. Sara, riding Bosh, revealed exemplary courage as she trotted her horse to the finish line and Shaikh Mansour accompanied her on the final furlong, much to the delight of the large number of supporters and families of the riders. Speaking to the media Shaikh Mansour said he was overwhelmed by the display of the riders. "This only goes to show that nothing is impossible. It was a great sight to see these riders display their enthusiasm and willingness to compete." "The riders showed that if one works hard the desired results will come," said Shaikh Mansour, who had been solely responsible for the organisation of this unique event. "Today's success has been very encouraging and this event will in future become an international ride," Shaikh Mansour said after distributing the trophies and medals to the riders. Meanwhile the winning rider's father, Khalid Hassan Al Hammadi, was equally elated and posed proudly with the trophy that the eldest of his five children had just won. "I am here with my family and we just wanted to cheer and give our support to all the riders. With Waleed winning the ride it is a special moment and we never imagined that this day would come," said Khalid, who is an employee in the UAE defence. The Land of the Sun Endurance Ride is a 25/50-mile ride that winds through the desert around Wickenburg, going through state, BLM and private property. This year’s ride was held on Saturday, Jan. 26. Following on from the successful Fast Track process for the *Rating of FEI Endurance Judges, the FEI introduced a similar process for the *Rating of FEI Endurance Veterinarians at the start of 2007. By 31 December 2007 most FEI National Federations had registered their FEI Veterinarians using the *Rating Criteria as circulated by the NFs at the end of 2006. In order to allow those Federations who have yet to submit their registrations an extension of time, the cut off date for using the FEI Veterinary Fast Track option will now close on 31 March 2008. Thereafter, any FEI Endurance Veterinarian who wishes to become *Rated must follow the full criteria as defined. As agreed, the use of *Rated Endurance Veterinarians at *Rated Endurance rides will remain voluntary throughout 2008. This will become compulsory starting January 2009. The Arabian Horse Association (AHA) is proud to name DA Al Capone+// (Ebony Masterpiece x Rabaska) owned by Cheryl Van Deusen of New Smyrna Beach, FL, as its 2007 Distance Horse of the Year. “Alvin” is an 11-year-old purebred Arabian gelding that was chosen for his excellence in endurance. Alvin’s most recent accomplishment was his selection as one of four horses to represent the United States Equestrian Federation (USEF) Team at the European Endurance Championships in Portugal. As the winner of the Distance Horse of the Year Award, DA Al Capone+//’s name will be engraved on a perpetual trophy donated by the Arabian Horse Owners Foundation and designed by Joe Staheli. Van Deusen will receive an engraved plaque. It has been quite the road to success for Alvin. He has logged 4,000 competitive miles in both endurance and competitive trail (CTR), with outstanding performances in each discipline. He has approximately 2,500 endurance miles from 50- and 100-mile competitions. This is not the first time Alvin has been recognized for his achievements. He finished Top Ten at the 2003 AHA National CTR, was grand champion at the Florida three-day 100-mile CTR, and collected two AHA reserve championships from Regions 12 and 8. Alvin racked up four Top Fives in Regions 12, 15 and 16 and, “wears his South East Distance Riding Association (SEDRA) High-Point Arabian cooler proudly,” said Van Deusen. Alvin shines just as brightly in endurance events. He has won a total of nine best conditions in his career. For 2007 he is currently the number one horse in the Southeast American Endurance Ride Conference (AERC) region and has won five of seven 50-mile rides. He earned a 2005 AHA National Top Ten and earned champion, reserve and multiple top five regional titles for 50- and 100-mile distances at regional rides. Alvin is an excellent example of an Arabian distance horse that seems to have no limit. Congratulations to DA Al Capone+//. 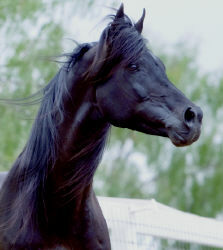 For more information on AHA distance programs, visit www.Arabianhorses.org/Distance. Two unlikely newsmakers share a story this week. People for the Ethical Treatment of Animals (PETA) has spoken out against a proposed endurance horse race across North Africa that would replace this year's Paris-to-Dakar car race. The famous off-road car race was canceled for security reasons, fearing terrorist intervention. Enter Omar Osama bin Laden, the 26-year-old estranged son of Al Queda leader Osama bin Laden. Bin Laden the Younger has proposed a horse race to replace the car race, and is serving as spokesman and organizer, with his British wife. The race would cover 4800 km (roughly 3000 miles) and the horses would "race" 30 miles per day. Bin Laden refers to the project in the international press as a "peace mission". Blayne Chenoweth, owner of Rocking Horse Arabians in Ramona, is a special woman with a special stallion. She is not your typical ranch owner. Appearing to be all of five feet tall and weighing 90 pounds, she is tough as nails and has a heart bigger than she is. Photo: Blayne Chenoweth and Corinthian relax after reining at the Ranch. Chenoweth began rescuing animals at age 10. She has rescued dogs, cats, horses, birds and many other animals. She often nurses them to physical and social health, and then helps to find them suitable homes. Any income she earns from the stallions on her ranch goes towards supporting the rescue animals. Chenoweth has been riding horses since she was four years old. She dislikes arena riding and has a passion to be out on a trail. When she learned about endurance riding, it seemed to be a perfect fit. She said that endurance riding is a way for her to relieve stress. Her profession is as an accountant; the balance in life for her is to be with the horses and the animals. If you are not familiar with endurance riding, it is a demanding equestrian sport in which horses and their riders compete over a trail that is typically 50 to 100 miles long. Endurance riding has its roots in the training of cavalry horses, which were often required to travel long distances over highly varied and dangerous terrain. 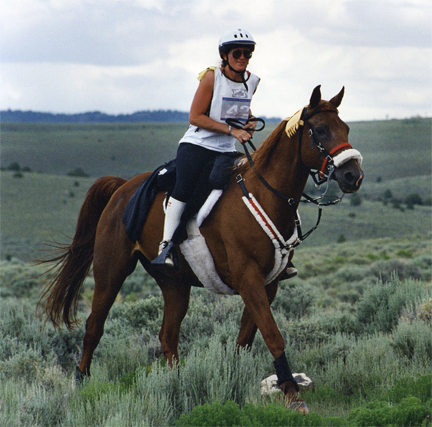 During an endurance ride, horse and rider follow a mapped trail which alerts the rider to hazardous trail conditions. The competition is timed, so riders must complete it as quickly as possible, with consideration that the strength and condition of the horse are also being judged. Competitors have 12 hours to complete a 50 mile ride, and 24 hours to complete 100 miles. photo: Corinthian has a spectacular view from Rocking Horse Arabians Ranch. Because of the physical demands of the race, the physical fitness of the horse (and rider) is extremely important. Horses are examined by a veterinarian at the start of the race and are periodically checked throughout the race. The veterinarian checks soundness/lameness, pulse, respiration and conducts other tests to make sure the horse is in good health and "fit to continue." If the veterinarian is in doubt about the condition of the horse, the horse is withdrawn from the competition to avoid the risk of injury. Chenoweth stays in shape for the races by doing power boxing, walking with her dogs and leading her horses for jogs on the trails. After being in the saddle for hours, endurance riders cross the finish line. The winning horse is the horse completing the ride in the shortest time. Many endurance rides award prizes simply for completing the race. Additional awards are usually given to the best-conditioned horses who finish in the top 10. Most recently Chenoweth has completed several successful endurance rides on her Arabian stallion, Corinthian DV. She prefers riding stallions because they teach her "how to live in the moment." Corinthian is a charismatic, black stallion who is an incredible athlete. She says all of his offspring inherit his athleticism and are great performace animals. He has a quiet disposition, beautiful head and neck, and is light and balanced. When Chenoweth first got Corinthian four years ago, she said he was angry. Using her abilities to heal animals, they now have developed an incredible, loving bond. She says he takes care of her on the trail, and he would lay down his life for her. She never worries when riding him, and he has never let her down, no matter how difficult the trail conditions. She says he is always quiet, calm, and polite while camping and riding around all the other horses at competitions. Chenoweth and Corinthian began their endurance career together in 2007. He won the 2007 American Endurance Ride Conference's coveted Jim Jones Stallion Award, a national award given to the stallion who has successfully completed the most competition miles for the year. What is even more incredible, is that he was only started under saddle three years ago as a 9-year-old after Chenoweth acquired him. Just a brief description of their many endurance rides together includes 105 miles in February at the Eastern Mojave Endurance 3-day ride, 105 miles in March in New Mexico, and several hundred more miles in Utah during late Spring. Starting in September, they went to Bryce Canyon National park to ride 105 miles of trails along the rim of the Pink Cliffs. Chenoweth said these trails provide some of the most spectacular views of the Grand Canyon region in southern Utah. Only two weeks later, they went on to do 50 miles at the Tejon Ranch north of Los Angeles. It is an extremely difficult ride with lots of steep climbs. In October, they went to one of the most incredible rides ever at The Grand Canyon Pioneer 5-Day Ride. At the north rim of the Grand Canyon, they experienced freezing temperatures and breathtaking scenery with brilliant golden aspen leaves falling as they trotted along the North Rim trails. They saw deer and a gray wolf crossing the trail. Chenoweth and Corinthian completed all five days and 250 miles, and also won the most coveted award given at a multi-day event. They won the Overall Best Condition Award, presented to the horse that completes all 250 miles and is judged by the head veterinarian to be the "most fit to continue." In November, Chenoweth and Corinthian finished the year by completing a 2-day, 100-mile ride in Moab, Utah riding through the Arches National Park. Chenoweth travels with her best friend, Elfta Hilzman, who also successfully competes with her Arabian geldings. Many Ramona residents may know Hilzman as one of our local, successful farriers. Corinthian DV (Wierz x Cosmopollytan by Bask) is a pure polish Arabian stallion who is 12 years old and 15 hands high. Chenoweth states that he is a proven sire of performance winners. If you are interested in inquiring about this stallion, or other stallions that she owns, she may be contacted at contact@rockinghorsearabians.com, or 858-759-6818. Great stories and information about Chenoweth, her horses and her rescues can be found on her website at www.rockinghorsearabians.com. Leading experts in equine health care and endurance-related fields will make presentations at this year's American Endurance Ride Conference convention, in Nevada later this month. The American Endurance Ride Conference (AERC) is the national governing body for endurance riding in the United States. The 2008 annual convention takes place over two days in Reno, from February 29 to March 1. 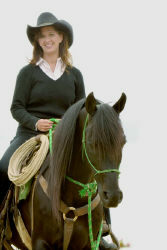 The convention's theme is "Riding With Education". Other highlights include a trade show, and regional and national award prize-giving. "Endurance riders emphasize the health and well-being of their horses. That is necessary for both beginning endurance riders and national champions in the sport," said AERC Executive Director Kathleen Henkel. Friday's seminar speakers include Susan Garlinghouse, DVM, who will discuss practical uses for recent research; Dane Frazier, DVM, will give his seminar on "There Be Dragons in Those Hills," on being your horse's advocate and protector during competitions; and Rob Keene, DVM, who will discuss new concepts for pain management in the equine athlete. AERC's Education Committee will present "Moving on Up" for riders who would like to move up to longer distances. Rallie McAllister, MD, will kick off the Saturday sessions with her "Riding for Life: A Guide to Lifetime Health and Fitness," which is based on her Riding for Life book. Dr. Frazier's Saturday session will be on avoiding mistakes at rides; Dr. Garlinghouse will discuss the 10 things riders can do better. An "ask the experts" panel will follow, with an open Q&A session with some of the top endurance riders from around the country.